Osteoporosis occurs when there is a loss of mineral content from bone mainly in the form of calcium. Osteoporosis shows no symptoms and is usually part of the normal aging process. However some women develop the disease early in life due to other co-existing disease factors. 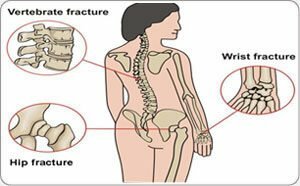 Since it displays no symptoms it is only when you get a fracture or recurrent fractures, that your doctor will suspect osteoporosis. The development of strong bones begins early in life. Staying healthy throughout life is an excellent way to keep our bones healthy. Calcium: To prevent osteoporosis we should eat a well balanced diet with adequate amounts of dairy products, which are the primary source of foods rich in calcium. Vitamin D: It helps increase our calcium absorption from the gastrointestinal system and kidney and thereby makes it available to our body tissues and blood. It also functions to help with the deposition of calcium to our bones. Exercising: Exercise can help you slow down the progress of osteoporosis and build strong bones. An exercise regimen that consists of moderate, regular exercise, thrice or four times a week can be beneficial in the prevention and management of osteoporosis. Calcarea carbonica: Indicated for low back ache, osteoporosis and joint pains.